"In more Westwood related news, the well known company has been seperated from EA and will now continue to operate as they did during the good old days of the orginal CNC..." Well, we can dream can't we? It seems the westwood team is no longer and that has been the news of late, and so without further delay I present to you, a Loaded INC tribute to Westwood: "Westwood: Gone but not Forgotten". The mission itself consisted of two parts. The first part was destroying a Chinese outpost with a limited number of units given to you right off the start. Once that was accomplished (most of the job was done by sending all the bomb trucks against concentrated targets) the second part involved the destruction of the dam. So being a low-tech mission, I had to do my job with Scorpion tanks and supporting technicals that mowed down the masses of Chinese infantry that were unlucky enough to block my path. As I said, destroying all the Chinese bases in the area was not a primary goal and I later realized that there is a route your forces can take that leads directly to the dam and you encounter only minimal resistance. You are also told in your initial briefing that there is a hidden Arms Dealer building somewhere close to your starting area, so if you want to sacrifice some time looking around for it, you will save some money in the long run. Click here to keep on reading. There is some brand new info in this article, so be sure to check it out! Contrary to early reports, virtually the entire EA Pacific team, currently located in Irvine, California, will be continuing on and moving to the new Los Angeles campus. Earlier today, before the consolidation announcement, EA Pacific's Mark Skaggs told GameSpot that the studio has strong growth plans and has a couple projects lined up, including an expansion pack for Generals. HomeLAN has more information on the closings of both Westwood Studios and EA Pacific as announced by Electronic Arts earlier today. EA's Vice-President of Corporate Communications Jeff Brown told HomeLAN this evening in a phone interview that the new consolidated Los Angeles EA studio (which currently handles the Medal of Honor series) will be the new development home for the Command and Conquer franchise. Most of the C&C: Generals team will be moved to the new LA studio and Brown said there are still plans for new C&C titles in the future. For players of Westwood's massively multiplayer RPG Earth and Beyond, Brown told HomeLAN that the game's servers and support will be moved to EA's Redwood Shores, CA studios (where Motor City Online is based) in about a month after the closing of Westwood's Las Vegas offices. The transition should be seemless for players, according to Brown. Brown stated that Earth and Beyond's subscriber base is growing and that EA still plans to support the game. The new LA studio will be moved into a new building this summer, according to Brown, and will have 200 employees at first but Brown told HomeLAN that EA plans to hire as many as 300 more people for the new EALA studio within the next year after the move. I figured it was best to give you the post in it's entirety. Interresting name... EALA. Well, it is good to know that CNC will not die because of this merger, and the exisiting and soon to be released titles won't be affected. That basically sums up how I feel. It is sad to see Westwood go, but I am sure that there will be plenty of great CNC games in the future. I could have started this post off with the title "The End of Westwood," but after thought, I've released it's about perspective. Anyway, now that I've got your attention, I might as well start from the beginning. For the quarter ended Dec. 31, the videogame maker late Wednesday reported net income of $250.2 million, or $1.69 a share, compared with $132.3 million, or 92 cents a share, a year earlier. Revenue soared 48% to $1.23 billion from $832.9 million. When releasing fiscal second-quarter results in October, Electronic Arts projected third-quarter earnings of $1.52 to $1.60 a share on revenue of $1.08 to $1.18 billion. The company's earnings target doesn't include studio restructuring charges, which are still being determined. Electronic Arts said that in the current quarter it will begin consolidating its Los Angeles, Irvine, Calif., and Las Vegas studios into one major game-development studio in Los Angeles. On Wednesday the company also said it planned to consolidate studios in Los Angeles, Las Vegas and Irvine, California into a central Los Angeles studio. Jenson said about 50 jobs would be cut as a result. It means the end of Westwood Studios and the short-lived EA-Pacific as we know it. What isn't certain is exactly what jobs will be cut and whether games will continue to be published under the name Westwood Studios. Who knows, at worse-case it could even mean a near-approaching end to CNC. But remember everyone, it's all about the money. That's why there's still a good chance that games will continue to be published under the name Westwood Studios, one of the most recognizable and respected in the gaming industry across the globe. Change isn't always a bad thing though. In any case, it's a sad day, and things will certainly be changing, for better or for worse. I'll be keeping you updated as more information arrives. After receiving reports that some people were having trouble downloading and playing a few of our videos, I've re-uploaded a couple of them. The 4th US Mission video has been uploaded along with the Operation Blue Eagle video. I also compressed the Operation Blue Eagle video -- I was able to crunch off 30 MB without losing much quality at all. Click on the thumbail to go to our German partner site and see the full-sized version. Also, a foreign website called GameStar has posted 40 new Generals screenshots! Click here to see them! A source tells Transnote from RenegadeGenerals that the World Editor won't be released before Generals. "One of the biggest reasons was that the editor requires the models/textures that are part of the game files to operate correctly." The editor will be shipping with the retail version of the game however. We're still waiting on approval to release the World Builder editor online. As I mentioned in an earlier post, I can't give out a firm release date because I don't have one. Once we get any new info, we'll update you. I know you've been waiting a long time for it, but it won't be long now. Nothing too much new there. I guess we'll just have to wait and see. How important is communication? It does, after all, require effort, and that is something many people just can’t be bothered to put in. Well, it does unlock an entirely new set of strategies, for a start, and in team games will almost guarantee you a victory. Five tanks are potent enough, but when the drivers of those five tanks have arranged their targets and priorities beforehand and don’t waste a second of their time, it’s even more of a danger. Case scenario – two snipers cover an entrance, two enemies enter. The pair who have their sides well organized take out a target each, threat negated. The pair who don’t talk at all target the same person; one enemy breaks through. That’s a pretty simple example, but you get the idea. Obviously it’s harder with multiple enemies. - Players who win a ranked game will recieve 3 points. - Players who lose/surrender/disconnect will not recieve or lose any points. - Ladder admins will be able to password the ladders for a closed ladder if they wish. They will also be able to choose if the players can choose maps and factions manually or if they will be choosen randomly. The European Generals Website has posted an online Generals "card game." Head here to check it out. CNC Matrix has posted the Chinese Nuke Cannon as their "unit of the day!" Pay them a visit to have a look at this weapon's capabilities. Morphious of GenEdit2k reports that they've been sent information about a new singleplayer infantry unit that cleans up hazardous materials. Head over there to see a screenshot of the unit. So there's the latest news. Get surfin'! As you can see, I updated our frontpage layout a bit yesterday. I'll be tweaking it some today, so if you have any comments about it or suggestions then please post a message in our forums. I've just completed a small update to our forums. I've removed most of our old avatars (about 200 of them) that had absolutely nothing to do with Generals. However, I did my best to not delete any that were in use at the time. I've also added a bunch of new avatars. They're the build icons for most of the USA and China units. You can click here to visit our forums and check it out. If you haven't already, I highly recommend you join and become an active member in our forums. It's a great place to ask questions, get all sorts of information about Generals, and just plain old chat with people. Our dedicated forum members will be able to answer most of your questions, whether they're Generals-related, CNC-related, and even tech questions. If we're not able to answer them, we'll be sure to suggest where you can look to get the answer. So what are you waiting for? Join today (it's free of course) and become a part of this ever-growning community of Generals fans! The Official CNC Generals website has been updated. The site now shows a release date countdown in the bottom right corner. There are also a few other minor updates. To see it for yourself, click here. I've completed the upgrades to the poll system early, and now we have a new poll! This time the poll is Will you use the World Editor when it is released? Be sure to vote on the right side of the page. Does your computer meet the new system requirements? I've closed the poll early this week because I'm going to be doing some work on the poll script. I am hoping to have a poll back online in a few days. -Mark Skaggs said as soon as C&C Generals hits retails shelves, the EA Pacific team will get to work on an Add-On for the game. Yes, that means an expansion pack IS in the future for Generals. -Mark stated that fans can expect "more and fuller support" than with past games. Sounds like great news to me. However, I should also note that it is now unknown if the map editor will be released before Februrary 11th. It has been confirmed though that it will ship on the Generals CDs. Just a bit of insight for everyone on what happens after a game goes gold and the "gold discs" are sent to the disc manufacturer. When you send a product to manufacturing it usually takes 24-48 hours before you get a "silvers" back for verification. A "silver" is a disc produced from the "glass master" that is used to mass produce the discs for the game. After the silvers are verified, then duplication can begin according to the manufacturing schedule of the disc duplicator. Once the discs are duplicated, they have to have their labels painted onto them and the be put into the jewel cases. Jewel cases are put into retail boxes along with various other paper goods, including the manual. After the boxes are put together then, they are put into bigger boxes that hold sets of something like 24. Once all the big boxes are ready, they are shipped to EA's distribution warehouse in preparation to be sent to distribution centers across the country or directly to retail stores. Add up all the time involved there, including sending the discs to the warehouse, and you can see that it's about a 3-4 week process Generals is ready to be shipped to retail stores. Another factor that adds time between gold and retail is the fact that we're doing a simultaneous world-wide ship in 8 different languages. Not an easy task, but EA's a pro at doing this sort of thing. Perhaps no other PC game has spawned as many spin-off series as Command & Conquer, and interestingly, it's not the setting, but the gameplay style and mechanics, that successfully carries over from one C&C series to another. Renegade, Westwood's first shooter, was the last game set in the Tiberian universe, and it likely won't be the last to pit you against the forces of NOD. But EA's hopes for Command & Conquer's renewed success are riding on Generals, which not only adopts a new, near-future setting, but one with eerie echoes of the international conflicts filling today's newspapers. Generals is now nearing release, and as much as the 3D engine has impressed us from the game's unveiling, we've finally seen enough of it to say that, beneath all the flashy effects, there's plenty of depth to make it an outstanding game. Just wanted to make note that, since I am going to be quite busy with my personal life for the remainder of the week, I won't have time to update the GLA Units page. The multiplayer test has ended and because of many differences between the MPT version of Generals and it's final version, it has become difficult to write any more accurate information. Therefore, I've decided to restore the old version of the GLA Units page for the time being, with some bits of updated information. It isn't anything too impressive, so don't get your hopes up. I probably won't be updating the page until after Generals is released on February 11th. What is the best part about Generals? Everything is so good, I can not decide! Amer Ajami has been writing about games since 1995. He started doing simple reviews of user-created maps for Duke Nukem 3D and eventually cofounded a pair of gaming and hardware-related Web sites. No word on the World Builder yet. We should know more by next week. The EA Store is now offering the Officer's Club Kit as a purchasable item for $4.95. Click here to see what's included in the kit. Computer and Video Games has interviewed Generals producer Mark Skaggs. You can read the interview here. CNC Universe has posted scanned pages from the PC Powerplay Magazine's February 2003 preview of Generals. The preview doesn't contain much new info, but you can head here to check it out nonetheless. Back Stabbing: In Custom games for some insane reason some players just turn on their allies and destroy them before they can react. Another version of this is too build 10 Nuke Reactors in the allies base and just leave the game, completley destroying said base. This is completley uncalled for, almost always makes you lose the game and makes you unlikely to forgive this person. Planet CNC's Beta Center has been updated with a bunch of new screenshots and an interresting battle story. CNC Sector has a new Generals wallpaper up. Click here to check it out and download it. Screenshots of hidden, old, and no longer used units! Renegade Generals has gotten a screenshot of a battle ship. You can find that along with a few other neat singleplayer screenshots at the top of their Screenshots page. Also, GenEdit2k has been posting screenshots and W3D images of hidden and scrapped units for the past five days. They've got several images posted, so definitely head here to check out unit that you've probably never seen before. CNC World is currently down for updates, and they're looking for people people to help out with the site. Visit CNC World for details. CNC Uprising is looking for staff! They're looking for staff to do content for Renegade, RA2, YR, and Tiberian Sun, along with other positions. Contact them for details. Community Team has two brand-new singleplayer screenshots, featuring a more classy command bar and more. The screenshots can be found here and here. And last but not least, CNCGenerals.info (German) has found two other singleplayer screenshots from IceBird.net. Click here to check em out. If you've actually read all of this through, then I must say I'm impressed. I'm going to try to stay on top of the news more from now on, so that I don't have to do huge roundup posts like this as often. As of today I will no longer be handling the community management aspect for RA2, Renegade, and Generals. What does that mean? Simple, the guys over at Electronic Arts Pacific will be taking over all the community activities based around C&C Generals. Here at Westwood, the team will be looking to bring on a new community manager ASAP to handle both the RA2 and Tiberian series. Until the new community manager, here at Westwood, is on board and up to speed, webmasters are more than welcomed to send me an e-mail with questions or concerns. Those sites looking for Generals related info please contact Amer Ajami (associate producer) over at EA Pacific (details below). Now many of you may be asking yourselves "What's next for Delphi?" Well, I have been given the opportunity to work for the development team on a next generation title being created by Westwood Studios. Sadly, I cannot talk about the project at this time, but I can guarantee you will be "VERY" surprised when it's announced. I want to thank all the modders, webmasters, news updaters, and everyone who has help to shape the C&C community into the large network of sites it is today. Your hard work and dedication has always meant a great deal to us. I'm sure we'll all be missing Delphi. He did a great job as community manager for Westwood. I'm also glad to hear that he's still working at Westwood. And to think they're already working on another "project" ... makes ya wonder. IRVINE, CA (Jan. 13, 2003) - Electronic Arts announced today that, for a limited time, it will offer a series of three collectable boxes for the retail version of Command & Conquer Generals(tm). This highly-anticipated 3D real-time strategy game will be published by EA (NASDAQ:ERTS) under the EA GAMES(tm) brand Feb. 11, 2003. The series of collectable boxes for Command & Conquer Generals will feature three images, representing each faction in the game: the United States, China, and an underground political terror organization, the Global Liberation Army. 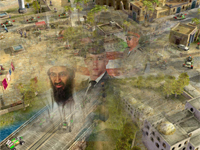 Each box front is a complete image, but when placed side-by-side, the three images form a continuous modern warfare scene. EA will distribute all three boxes in the initial printing of Command & Conquer Generals. Once those have been purchased at retail, EA will only manufacture the U.S. version of the box. Players who wish to purchase either the GLA or Chinese versions need to do so as soon as the game is released February 11 to ensure they receive a copy. Command & Conquer Generals puts players' trigger fingers on the pulse of modern warfare as they become a powerful general and control massive armies of bleeding-edge military weaponry across a globe teetering on the brink of Armageddon. Three unique sides will be available, each with customizable high-tech arsenals ready to deliver unprecedented firepower on land or in the skies. Players can annihilate the opposition in the 23-mission single-player campaign or dish out the damage in global multiplayer mayhem. Players who pre-order Command & Conquer Generals from participating retailers will receive an Officers Club pack that contains exclusive in-game elements and information. Included in the pack is an interactive CD-ROM and unique medal icons that will appear by the player's name during multiplay matches. Retailers currently participating in this program include www.EA.com, Electronics Boutique, www.EBWorld.com, GameStop, www.GameStop.com, CompUSA and MediaPlay. 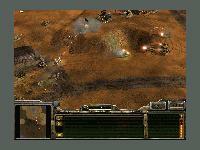 Players who wish to play Command & Conquer Generals weeks before it hits stores can visit www.FilePlanet.com. Beginning January 20, the first twenty thousand FilePlanet subscribers who sign up at the site will be given the opportunity to play in a limited version of the public multiplay test at no charge. 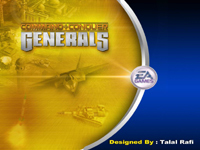 More information on Command & Conquer Generals can be found at http://generals.ea.com. Also notice that the press release states that on January 20th, the first 20,000 FilePlanet subscribers who sign up at FilePlanet will be able to play a limited version of the Generals multiplayer test. I'm sure all you anxious people that aren't testers won't forget that date. The question has been asked if we will get out another patch out before we ship. As I posted before, everyone on the team has been putting in 14-18 hour days for the last two months to finalize Generals, so the answer would be no. Do we want a patch so you guys can see all the sweet enhancements we have put in? Do we risk the ship date for the above? Can we put in 24 hours days for this to happen? Would be nice, but we are only human. Well, when we go to manufacturing on 1/20 it will be the time we close down the GMTP and get ready for the retail version. 1. No matter what you do, not everybody will be happy. 2. When you try to make the remaining people happy, it's still not good enough. 3. Those who understand the process support the Dev Team here at EAP even if they agree or disagree with what we have done. These people are going to experience a great game. 4. Those who don't get their way tend to assume, second guess, and give up. Unfortunatly, they are going to miss out on a great game. Those who understand the process didn't need a acknowledgement from Ol' Shan saying "Hey Jimbob, great idea! thank's for the suggestion" for validation. Instead when they play the game and see something they submitted they will say "Sweet!, I sent a suggestion for that! "...that will be worth more than any message I could have posted. There ya have it folks. All you testers best keep on playing while ya can. As for the status of the World Builder? "Still working on getting it out, as soon as I know something I will let you know." One month until CNC Generals is released: WAHOO! And also in the news: there is not relevant news! WAH--oh. Sorry, no new videos have come out, and news is slow. Look on the bright side, Generals World has almost reached a quarter of a million hits! It is Coming: Beta Milestone! IRVINE, CA (Jan. 8, 2002) - Forget CNN! Take control of the war in the Middle East for yourself. Electronic Arts announced today that the highly-anticipated 3D real-time strategy game, Command & Conquer Generals(tm) has hit its beta milestone, and will ship to stores Feb. 11, 2003. 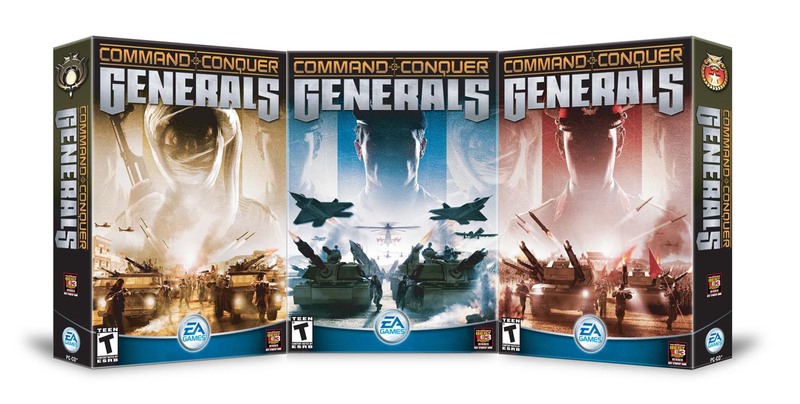 Command & Conquer Generals will be published by EA (NASDAQ:ERTS) under the EA GAMES(tm) brand. Achieving the beta milestone indicates that Command & Conquer Generals is now feature-complete and the development team is now finalizing the game to be sent to the manufacturing plant. "The beta milestone is a tremendous achievement for the development team," said Mark Skaggs, general manager of EA Pacific and executive in charge of production for Command & Conquer Generals. "More than 50 of our industry's top talent have been working non-stop for the past several months to ensure that we have a solid, highly-polished, immensely-enjoyable game. EA is currently conducting a public multiplay test of Command & Conquer Generals, involving more than 3,000 people around the world. The public test is giving participants a chance to play the game's multiplay mode via the Internet, includes five maps, and allows gamers to play as each of the three unique sides in the game. "The community's feedback from the multiplay test was instrumental in helping us achieve this beta milestone," continued Mark Skaggs. "I do want to stress that we will continue to solicit their feedback to further balance and enhance the multiplay experience before shipping to stores." Hey! We have two new wallpapers. One made by Talal and the other by myself. Their decent and work well on any old computer. They come in all three standard sizes: 800x600, 1024x768, and 1280x1024. Thumbnails are below. Click here to go to the wallpapers page. Enjoy! This just in! It's a press release from Frank Klepacki, music artist for many CNC games. Frank Klepacki has officially released his debut electronica CD entitled “Morphscape” via his website http://www.frankklepacki.com. But for now, “Morphscape” will serve as his healthy new synth based offering to the masses. Listen to the music clips and order one today at www.frankklepacki.com! Since we've been lacking community news recently, I'm doing a monster community news post. Some of this news is going to be a few days old, so bear with me. Shanahan has posted the latest balance changes in CNC Generals over at the Official Generals Message Boards. You can read the post here. He's also posted a second post, with more changes here. Remember the Westwood vs the World tournaments? Well Delphi has announced that he's already slated EAP vs the World to begin on Feb 21st at 10:00 AM and 5:00 PM PST. More information is sure to be released later. Active Reviews has posted a revew of CNC Generals with a few screenshots. They gave Generals a 4 out of 5. You can read the review here. CNC Sector has new forums up. Community Team (German) have posted two old high resolution Generals screenshots. One shows an old China unit that was going to be in the game. 1) If you submit your renegade skins to us or ra2 or yuri maps, we will review them and out the lot of files we get subbmitted we will pick the two creater's who made the best one and give them a following prize! By the way, this is a promise! Prize 1: A copy of Generals when it comes out. Prize 2: A copy of Ra2 or Renegade or £10 in cash. Metal Gaming has a three-question Q&A with Dustin Browder, a CNC designer. Head over there to check it out. Shinano from CNC Universe has posted up a cool Generals screensaver! It's 3.6 MB. Head on over there to download it. CNC Universe also has that Beta Tester Chat log up. You can read that here. RA2 Warehouse has a new Generals article written by Billy. Time of War (French) has posted up the requirements released by EA France for Generals. They're a bit different than I had expected. The EAP Generals Dev Website has been updated with the following post. It mentions the World Builder for Generals, and a Voodoo Extreme poll! Wow talk about being busy...it's been total crunch time here at EAP trying to finish Generals. We should have some files up soon for World Builder, but in the meantime Voodoo Extreme is conducting a readers’ poll – hit the site and give a vote for Generals! CNCDEN has a few well Generals wallpapers up! Transnote from Renegade Generals has posted a new wallpaper, sent in by one of their fans. They've got a bunch of other great wallpapers too, so check out their wallpapers page. And last but not least, less than 34 days until Generals is released! I've got another site update for y'all today. I've completed the China: Structures page. Click here to check it out. What do you download the most from us? I'm planning on finishing the GLA pages for this weekend, so check back often! This is being posted a couple days late, but it's worthy to note nonetheless. Generals Bunker and CNC Bunker have merged! They've combined together to form the returning CNC Sector! I must say that everything over there is looking great! They've also joined up with their new GameAnnex network. Be sure to visit their site -- great work Jamie & staff!